King David ruled with Jerusalem as his capital over Judea, the first united kingdom in an area, which roughly corresponds to today's Israel including the West Bank. After the death of David's son, Solomon, in 931 BCE the kingdom was divided into a southern part, Judea, and Israel in the north. (today northern Iraq), invaded the northern Kingdom of Israel and deported the Jews to other parts of the Assyrian Empire. The Kingdom of Israel perished. After the fall of the Assyrian Empire the Babylonian king, Nebuchadnezzar II, conquered Jerusalem. The most influential Jews of Judea were deported to Babylon (in southern Mesopotamia, today Iraq). 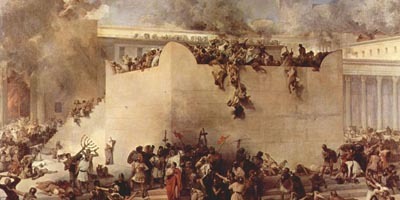 The first Jewish temple in Jerusalem was destroyed. 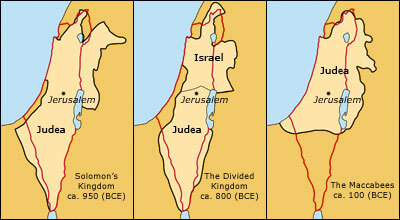 The Kingdom of Solomon, the divided kingdom and Judea at the time of the Maccabees (the exact borders are subject to some uncertainty). The red line describes Israel's current borders incl. Gaza, the West Bank and the Golan Heights. King Cyrus of Persia (today Iran) conquered the entire Babylonian Empire, allowed the exiled Jews to return from Babylon, and accepted a form of Jewish home rule in Jerusalem. The Jewish temple was rebuilt. The Greek-Macedonian ruler Alexander the Great destroyed the Persian Empire, thereby gaining control over Judea. After the death of Alexander his Hellenistic (Greek) Empire was divided into three parts, and the Jews got squeezed between the competing Greek rulers. A Jewish tribe, the "Maccabees", revolted against the Hellenistic occupiers, and from 142 BCE and the following 80 years Judea once again was an independent, Jewish state. The Romans invaded Greece and also conquered the Hellenistic Seleucid Empire in the Middle East. Though the Jews were granted some measure of autonomy in Jerusalem, Judea was in reality ruled from Rome. A model of Jerusalem at the time of the Second Temple. Following a failed Jewish rebellion, the Romans turned Judea into a regular Roman province, and installed the Jewish King Herod the Great as administrator. After his death in 4 BCE the province was divided between Herod's sons. One of them, Herod Antipas, who is best known for his role in the New Testament, administered Galilee in the north and Perea to the east (the east bank of the Jordan River, today part of the Kingdom of Jordan). The Roman Emperor Titus quashed yet another Jewish rebellion. The Jewish temple and the rest of Jerusalem were reduced to rubble. A group of especially persistent Jews sought refuge on the mountain of Masada in the desert near the Dead Sea, but were three years later defeated by the Romans. During a final Jewish uprising against the Romans (the Bar Kochva Revolt) Jerusalem was once again, for a short, three-year period, under Jewish control. After the Romans' inevitable, crushing victory many hundreds of thousands of Jews were either deported, sold as slaves or killed. The Roman Emperor Hadrian leveled Jerusalem to the ground, and barred Jews from entering the city. In an attempt at definitively eliminating the Jewish connection to the land, the Romans renamed Judea to "Palaestina", a word believed to be derived from the "Philistines", a people from Crete, which a thousand years earlier roamed the Mediterranean coast of Judea. Jews still lived in the area, though, and less than 100 years later they were once again allowed access to Jerusalem. The destruction of the Second Temple, 70 AD (by Francesco Hayez, 1867).